Our weekly roundup of new and newsworthy transportation projects worldwide. The two largest cities in the state of Kerala, at the southern tip of India, will get new rapid transit systems as previously planned, but their form will change. Where monorail systems had been proposed for the capital of Thiruvananthapuram and the state’s second-largest city, Kozhikode, light metros similar to those now operating in Manila and Monterrey are now on the drawing board. The Hindu reports that work on the light metro systems could begin as soon as four months from now if the government approves reports to be submitted Oct. 15th by the general consultant for both cities’ systems, Delhi Metro Rail Corporation (DMRC). Because the technology is already in use or under construction in several other Indian cities, the DMRC anticipates cost savings over the monorail as well because the two systems could be put out for bid separately, and light metros also cost less per kilometer — Rs. 160 to 180 crore ($26.242 million to $29.523 million U.S.) per km, compared to Rs. 250 crore ($41.004 million U.S.) for a medium-capacity regular metro. Downtown Providence has been on a tear over the past several years, ever since two major infrastructure improvements changed the face of Rhode Island’s capital and largest city for the better: the uncovering of the Providence River through the heart of the city and the relocation of Interstate 195 away from it. Together, these physical changes brought the downtown back to life by bringing people back to blocks that had suffered from neglect and disinvestment. Last Friday, the city received one of 72 TIGER grants awarded in 2014 to start work on a project aimed at continuing the momentum: a 2.5-mile downtown circulator streetcar line that will run from College Hill to the Hospital District and Upper South Providence via a part of downtown that I-195’s relocation has opened up for redevelopment. The $13 million grant would cover about 11 percent of the $117 million cost of the initial 2.1-mile route, whose southern terminus is Rhode Island Hospital just south of downtown. A future extension would take the line an additional four-tenths of a mile to Upper South Providence. 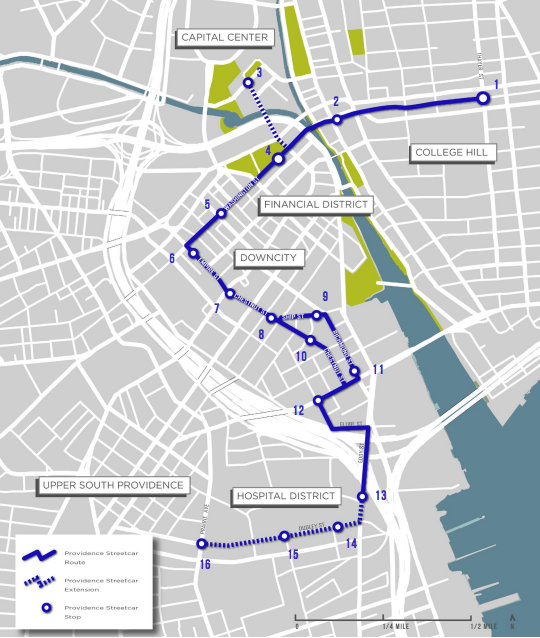 A City of Providence planning document projects that the streetcar will generate 3.5 million square feet of new development worth $1.1 billion and add 6,000 new jobs and residents (mostly residents) along its route by the time it is fully built out in 2033. The areas of greatest impact will be the Jewelry District, just south of where I-195 once ran, and the Hospital District, both of which have large tracts of vacant or underused land. Part of the route would run through a tunnel built in 1914 to carry streetcars under College Hill, now used by buses. The streetcar has become an issue in the upcoming mayoral election, GoLocal Prov reports. While Democratic candidate Jorge Eloza has declared himself in favor of using tax increment financing to cover the city’s projected 47 percent share of the project cost, his opponents, former Mayor Vincent “Buddy” Cianci and Dan Harrop, were critical of the idea, saying the funds were more urgently needed to repair crumbling city schools and roads. Both called on two major beneficiaries of the line, the hospital and Brown University, to chip in for the project. Omaha Metro, the public transit authority in Nebraska’s largest city, also received a TIGER grant that will cover a substantial portion of the projected cost of one element of a two-line system of mass transit improvements. The $14.96 million grant will help pay for an eight-mile-long bus rapid transit (BRT) line from 10th and Harney streets, next to the Heartland of America Park downtown, to Westroads Mall on the city’s west side. 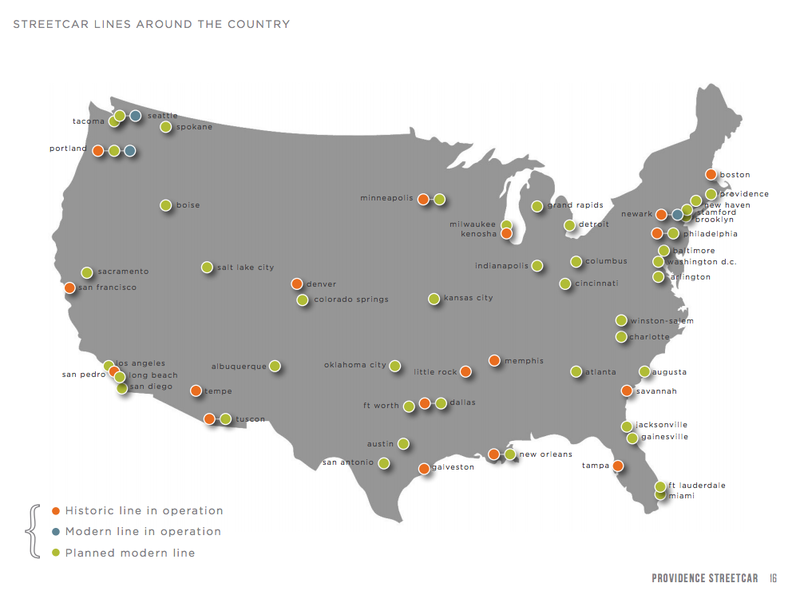 Major employment and commercial centers along the route include Midtown, the University of Nebraska Medical Center (UNMC), the University of Nebraska at Omaha and Crossroads shopping center. The route’s projected total cost is $31 million, and the grant will cover nearly half of that figure. The BRT route is one of two new transit services Omaha Metro and the City of Omaha identified as the preferred “combined alternative” in a two-year alternatives analysis project. The other is a 3.2-mile modern streetcar line that would run from North Downtown to the UNMC. Funding for this line has not yet been secured; identifying funding sources is one of the goals of the project’s second phase. Total cost for both projects is $170 million. KETV reported that the Omaha City Council voted to endorse the proposed routes last week, just ahead of the grant announcement. Know of a transportation project that should be included in this column? Send a tweet to @MarketStEl using the hashtag #newstarts.